MBAM is to be run as an adjunct to an antivirus not as an antivirus replacement. It is compatible with most AV's and it finds quite a few threats that AV's do not ordinarily detect and remove. I run MBAM and ESET on one of my PCs, and MSE and MBAM on the other. Also, I always keep UAC a full throttle! Let me look at your DDS and attach now. Your DDS logs look pretty good. Did you intentionally install these Programs? 1. Open Notepad, and on the Notepad menu, choose "Format" and make sure that Word Wrap is UNchecked (disabled). 2. Copy/Paste the text in the code box below and save it to your desktop as CFScript.txt by using the File -> "Save as" function on the Notepad Menu. If the run does not finish or You have problems, please launch Combofix in safe mode following the same directions as above. Update to a newer version, make sure you allow it to update. Upload infected files for analysis, please allow it to do so. Please copy/paste the log (C:\Combofix.txt) that opens when it finishes (Do NOT attach it). Something out of the ordinary did occur after the Combo fix reboot. When Combofix was preparing the logs, an IAStore program or application pop up came up in the background and it said to press "ok" to terminate application, or "cancel" to debug. I pressed "ok" in order to terminate the program because combofix said not to allow any processes to run while preparing the log... I'm not sure what this was all about, but maybe you do. I think I'm going to call it a night. We made some serious progress today! Thank you so much for you help, you're awesome. I probably won't home until mid afternoon tomorrow. Talk to you then! I honestly do not know why that IAStore pop-up appeared, but as long as Combofix finished and produced a log, I would not worry about what seems to be a one-time occurrence. If there had been a blue screen I would be more concerned. Yes, we did make substantial progress yesterday and it's just about time to wrap things up. Right-click aswMBR.exe on your desktop and select "Run as Administrator"
Copy MBR.dat to a CD or USB for safekeeping. 14:48:27.131 Disk 0 MBR has been saved successfully to "C:\Users\Dylan\Downloads\MBR.dat"
14:48:27.131 The log file has been saved successfully to "C:\Users\Dylan\Downloads\aswMBR log.txt"
Your scans are all coming up clean now and the rootkit that was causing your redirect problems has been disinfected. We have a perform a few "housekeeping" steps to remove the clean-up tools that we used!! Please retain the back-up copy of your MBR and make sure that you have burned it to CD or copied it to USB for safekeeping, so you have it in the event You need to restore it. Uninstall Combofix and all its associated files and folders. Flush your system restore points and create a new restore point. Here are some additional measures you should take to keep your system in good working order and ensure your continued security. 1. Scan your system for outdated versions of commonly used software applications that may also cause your PC be vulnerable, using the Secunia Online Software Inspector (OSI) by clicking the Start Scanner button. This is very important because recent statistics confirm that an overwhelming majority of infections are aquired through application not Operating System flaws. Commonly used programs like Quicktime, Java, and Adobe Acrobat Reader, itunes, FlashPlayer and many others are frequently targeted today. You can make your computer much more secure if you update to the most current versions of these programs and any others that Secunia alerts you to. Just click the "Start Scanner" button to get a listing of all outdated and possibly insecure resident programs. Note: If your firewall prompts you about access, allow it. 2. Keep MBAM as an on demand scanner because I highly recommend it, and the quick scan will find most all active malware in minutes. 3. You should visit the Windows Updates website, and obtain the most current updates/patches for your Operating System and Internet Explorer. However, setting your computer to download and install updates automatically will relieve you of the responsibility of doing this on a continual basis. It is important to periodically check that Windows Updates is functioning properly because many threats disable it as part of their strategy to compromise your system. Windows Updates (including a new Microsoft Malicious Software Removal Tool (MSRT)) are released on the second Tuesday of every month. Finally, please review the additional suggestions offered by Tony Klein in How did I get infected in the first place. so you can maintain a safe and secure computing environment. Do I need to keep the aswMBR logs as well or just the MBR zip? Do I need DDS or Gparted any longer? It doesn't seem combofix was fully uninstalled, it still seems to remain in Computer/(C:)/Users/Dylan/Downloads/Combofix, should I just manually delete this one, or is there another tricky way to take care of this? Also Secunia tells me my flashplayer is out of date, but then I visit the adobe flash website, and it says Flash is incorporated in googlechrome, and will update itself when needed... so I guess that one is ok even though Secunia says it is not? Good question - it is a good idea to keep the MBR logs so they can be compared to logs acquired at a future date if the need arises. You do not need DDS or GParted. The "first" because you should always download the latest copy of any system analysis program, and the "second" because you haven't been able to tweak your system to boot from CD. I would contact Acer support about that issue. That is the beauty of Chrome (its add-ons are built in and self-updating) , so you can ignore that and BTW the current version of Adobe Flash Player is 11.1.102.55. Alright, So I am a bit afraid to plug my external hard drive back into my computer, is there anything I should do prior to doing so? or just plug it in and scan it. I also just downloaded the free version of avast!, because I noticed that it did not remain after running the DDS scan, and it gave me the pro version for free to try for 30 days. When I downloaded this program it said it was creating a new system restore point for me, will this suffice or do I need to create another one myself? Whenever you install a new program or Windows Updates, a new restore point is created, so that restore point will suffice. You can plug in your external hard drive, and first scan it with a Malwarebytes quick scan. Then perform a full system scan with an updated Avast, followed by a full MBAM scan. If anything is detected you can post those logs. I want to start by apologizing for the lack of response on my part, my internet has been down, and comcast is still trying to fix the issues. So my external hard drive seems to have remained uninfected. I ran Avast! full scan, and it did find malware on my computer, and recommended I run another scan during the boot of my computer, which I did, and it found more problems, which I told it to fix, but it also found files that say ERROR file is a decompression bomb... I have no idea what this means, but there didn't seem to be a way to fix these problems with the scan. Then I ran malwarebytes full scan when my computer booted up, and this came out clean. Next I ran another Avast! full scan, and in this scan it found about ten or so files that it said it could not scan because they were archived files that were password protected. I have no idea why these would exist, or what their password would be. Once again I am sorry for not responding sooner. Also I am unsure of how to post these Avast! scans, all the information seems stuck within the program. I fully understand your lack of internet issues. No need to apologize though it is appreciated. sc reen, chec k the box “Crea te report file” as shown below. Save the Report as a TXT file by using the Text File radio button under "Type of File", and then attach it to your next reply. Ok, so my Avast! doesn't have an up arrow in the top left corner, and when I right click on the screen it doesn't do anything. I'm thinking that maybe since I have the trial version, it may not let me save my logs... I've searched though the help menu several times, and it is frankly, not helpful at all at helping you to navigate to the settings. 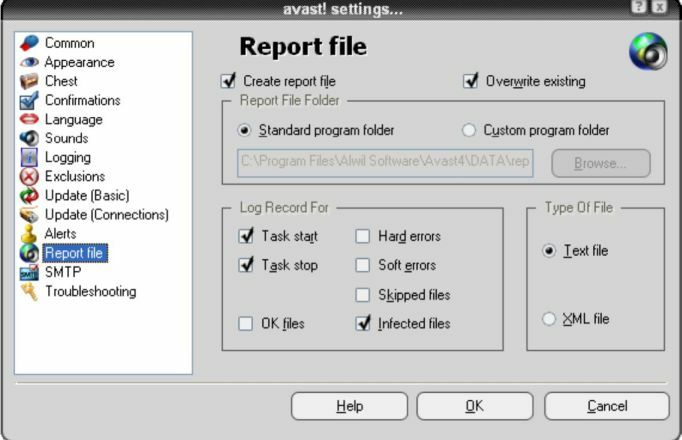 What you have posted indicates that AVAST didn't install properly and is missing important files. This may only have to do with the updating of AVAST definitions because all the missing files are in the /defs subfolder. My internet is still no good, I'm thinking this was probably the cause of these failed updates.